Dialogic OD… Old Wine In New bottles, Or Truly Revolutionary Change? 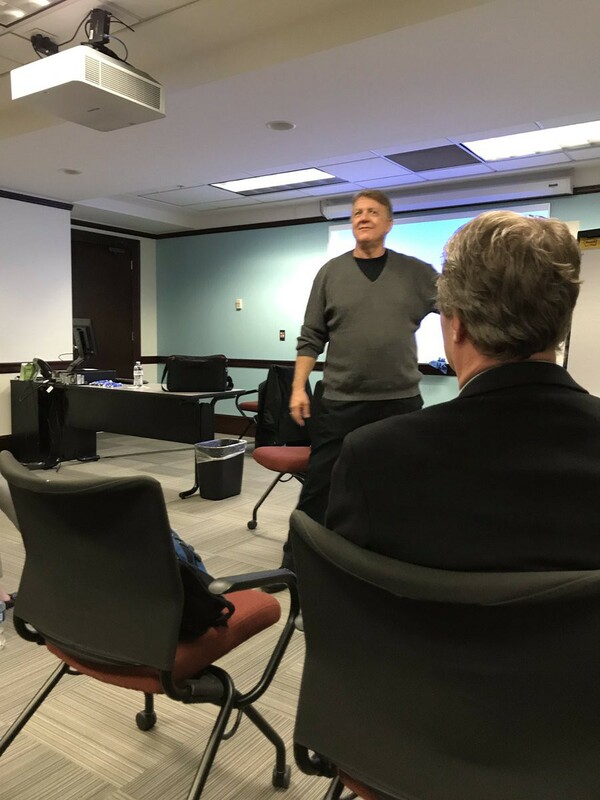 Thanks to the Minnesota Organization Development Network and the College of St Scholastica, I recently had an opportunity to attend a session to learn more about Dialogic OD with Gervase Bushe. Dr Bushe is Professor of Leadership & Organization Development at the Beedie School of Business at Simon Fraser University in Vancouver, Canada, and co-author of Dialogic Organization Development: The Theory and Practice of Transformational Change. I was quite curious as I have been reading how Dialogic OD is apparently very different from traditional OD. Is Dialogic OD a replacement for the conventional variety, or a next generation? Is it applicable for all typical OD situations, or is it aimed at a particular subset? Is it supposed to be equally effective for small-scale and large-scale OD? I was hoping to find out. Traditional OD would typically have a diagnostic phase followed by an intervention. I have not read extensively in Dialogic OD, so it may be my lack of deep understanding of the Dialogic OD approach. This means I had a hard time differentiating it from traditional focus groups, interviews and other work that may be part of assessing an organizational issue. “Dialogic” simply means “relating to, or characterized by dialogue” according to Dictionary.com, and that feature is reflected in this comparison. 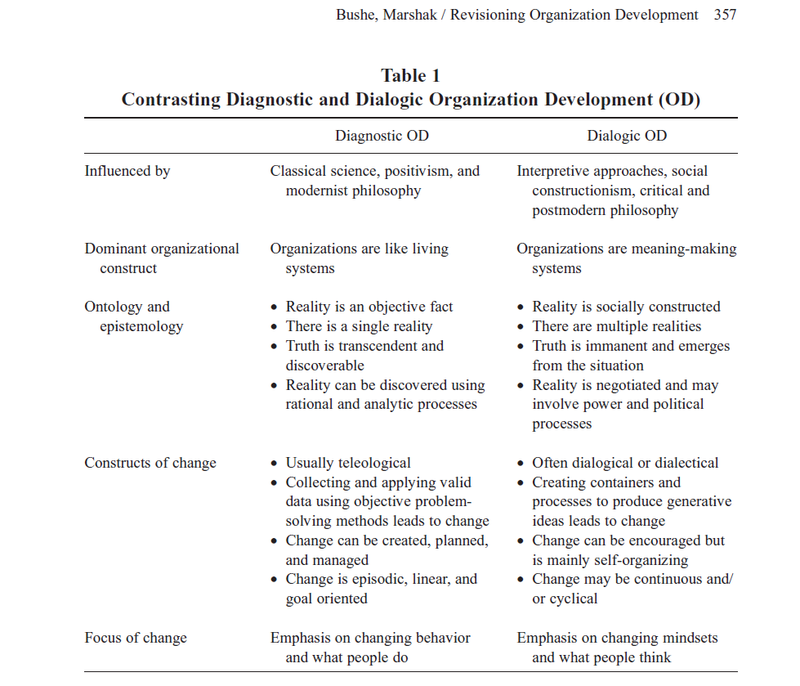 Revisioning Organization Development: Diagnostic and Dialogic Premises and Patterns of Practice Journal of Applied Behavioral Science Gervase R. Bushe and Robert J. Marshak 45: 348 originally published online 15 May, 2009. While this suggests different perspectives in the approach, it is by no means a strict dichotomy between two very different methods. But according to Dr Bushe there is more to it than just the dialogue. Five such techniques the approach encompasses are Appreciative Inquiry, Open Space, Future Search, and World Cafe, along with Technology of Participation. But Dialogic OD apparently also needs a what was referred to as a “generative image”. This term intends to capture the attention of the organization to help focus efforts (i.e., improve customer experience or patient experience etc.). One example Dr Bushe gave, “Sustainable Development”, illustrates how they they are often built on apparent paradoxes or words combined in novel ways. Dialogic OD is primarily aimed for “emergent change”. The idea behind it is that “change is based on the assumption that change is a continuous, open-ended and unpredictable process of aligning and realigning an organisation to its changing environment” (Burnes, 2009). This emergent change requires improvisation. An important part of Dialogic OD is to be crystal clear on what issue is being addressed by the organization. The primary stakeholders must also be clearly defined for this approach to be successful. Dialogic OD is willing to try a lot of things and see what works. Pilot projects are the norm to find out what might work to help improve the issue at hand. But my impression was that these elements are part of many types of Organization Development work. They are all key IMO to action research inside of traditional OD. The idea of pilot projects resonates well with the experimental ethos that is often found in applied behavioural economics. It can be seriously tempting to simply copy and paste a ‘proven’ approach, and it is refreshing to see trial-and-error explicitly recognized in Dialogic OD. But what about the leadership part of this equation? Dr. Bushe also stated that successful Dialogic OD needs a “generative leader”. 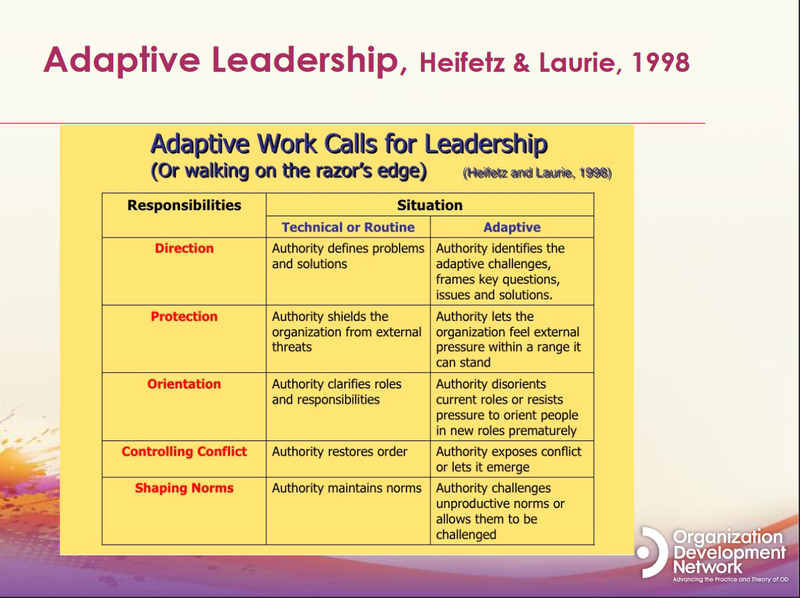 He illustrated this with the work of Ron Heifetz and what he calls the Adaptive Leadership Model. Adaptive challenges are ones that, unlike technical problems, do not stay solved. Dialogic OD is ideal for such stickier problems (and should not really be used with technical problems that may have more straightforward answers). Experiments are key to tackling adaptive challenges. Do not look for the one big “right” answer to an organizational issue. Instead, take any of the “probably good” answers to a problem and advance it. Gain traction with that one answer instead of waiting a long time for the perfect solution. So this sounds pretty good, right? Using a generative image to help create a new organizational narrative and help unify employees around new desired outcomes. Instead of deliberate planned change, (such as installing a new software system) Dialogic OD is for change which is fluid and not planned out in a regimented project management style approach. In some respects it is the opposite of an implementation with strong and ongoing change leadership. Dialogic OD also needs a leader which supports the change… who then gets out of the way. This is an approach that relies on both a mature organization, and mature individuals within it. The people involved will encounter many trade-offs, and without strong guidance from a leader, they need to choose in line with the organizational aspirations and the generative image. And they need to do so in proper concert with their colleagues. There has to be strong alignment and mutual respect and understanding in how they perceive the costs and benefits of engaging in pilots, how to prioritize opportunities, and how to eventually shape the fluid change process. The larger the scope of the change, the stronger the reliance of this approach on a stable, mature context. A solid narrative, constructed around the fluid change so that it chimes with the organizational beliefs can help mobilize people emotionally. That emotional coherence can then help defuse any tensions at the more rational cost-benefit level. Do not to assume that the same beliefs hold in every nook and cranny of the organization, though — especially if they are large. What is the Evidence for Dialogic OD? So the approach does seem to have potential. And what does the research say? Is there empirical research showing this approach is effective? Is this just a T-Group with new dressing? Is it a fancy way of talking about story telling that might impact thoughts but have little impact on behavior? Stay tuned for Dialogic OD Part II where we will dig further into these questions! There are many resources available here from Dr. Bushe and Dr. Marshak. Organization Development and … Physical Therapy? Eclectic wisdom from Organizational Psychology and Behavioural Economics for a better workplace.